This section is dedicated to boating with Monthly Boating and Equipment Tips plus Books, Equipment, Tools and Supplies recommendations. Please feel free to send us your tips and recommendations. Test Your Shore Power - BEFORE you plug-in you shore power in! Why: It is way too easy to have significant electrical damage from plugging to shore power that is incorrectly wired, especially in other countries where electrical configuration might be different then your boats or your expectation. An owner of a catamaran had mentioned having over $30k in electrical damage from plugging into a marina shore power pole that have been incorrectly wired. We have seen shore power missing ground or having incorrect neutral. What you need: An inexpensive AC receptacle/outlet tester ($5-$15) and a shore plug to standard Edison plug adapter ($25-$50), for example 30 Amp 125V Locking Dock Side/Male Plug to 15 Amp 125V Straight Blade Female Connector. How to test (outlets on your boat): first off every boat (and/or house) with AC power should have an AC receptacle/outlet tester with ground fault circuit interruption (GFCI) check for testing every receptacle/outlet prior to purchase and periodically. These inexpensive AC receptacle/outlet tester ($5-$15) are simply plugged into the outlet to detect common wiring faults: open ground, open neutral, open hot, hot/ground reverse, and hot/neutral reverse plus have a GFCI button for testing GFCI outlets or circuit breakers. 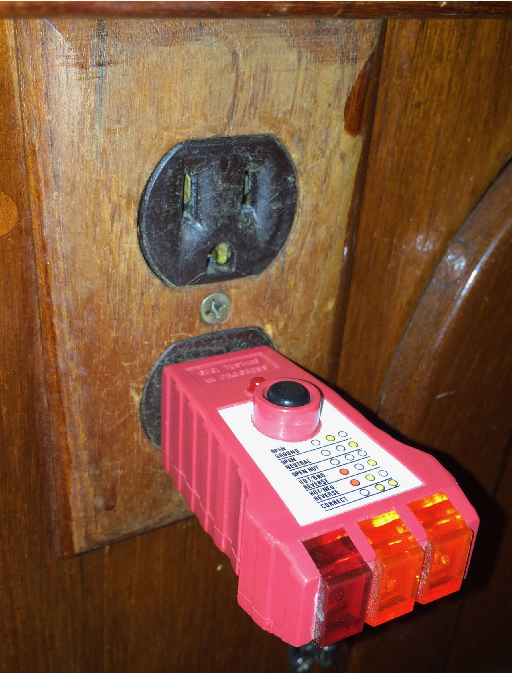 Check each of the AC receptacles/outlets on your boat by simply plugging the AC receptacle/outlet tester (aka which lights should be on) into an AC outlet and checking the tester’s lights in accordance with the instruction for your specific model of tester. In general, if the lights indicate “Correct”, your power is correctly wired. 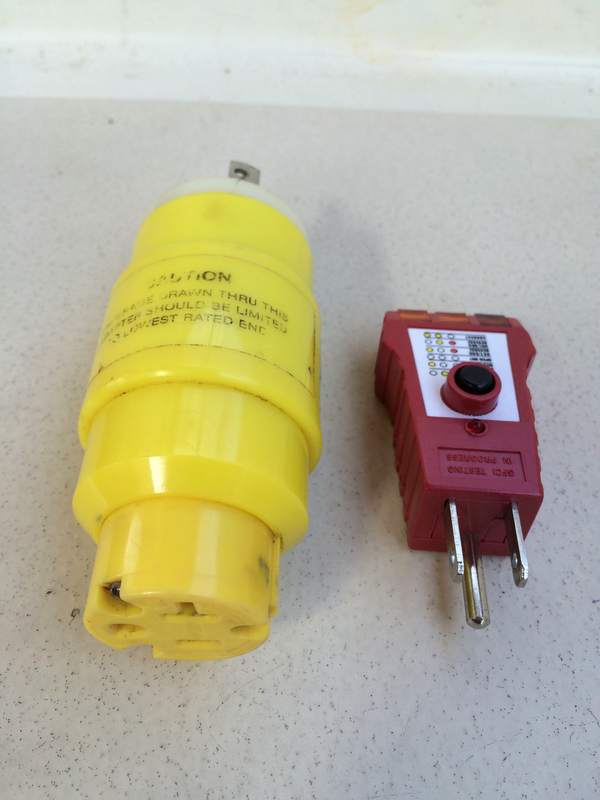 How to test (shore power): plug the AC receptacle/outlet tester into the shore plug adapter to standard Edison plug. Now plug the shore adapter with AC receptacle/outlet tester into the shore power plug and checking the tester’s lights in accordance with the instruction for your specific model of tester. In general, if the lights indicate “Correct”, your power is correctly wired. Non-Contact Infrared Thermometer with laser targeting or pyrometer thermo gun. This multi-functional tool can be used for checking the engine, electrical, HVAC, moving components for friction/malfunctions and even the temperature of your coffee. Insure that the thermo gun selected has a wide enough temperature range (-76 to 932 °F or -60 to 500 °C), especially for diesel engine, a quick response time (1 second or less), a distance to spot ratio of at least 10:1 if not 12:1 or great plus an auto shut off. Most units have a Max, Min, and Hold options and the more expensive units have Average and Differential Readings. Optional light or backlit LCD display is also handy to have. Many users recommend a dual lasers help pinpoint the edges of the measurement area. Experts recommend being "careful on distance” to the target does not affect the accuracy of the thermo gun. Engine diagnostics - for example, our Universal 32hp, the raw water and engine side of heat exchanger should have 30-40% differential and the mixing elbow should be under 200 degrees at any unprotect location). Mechanical test - anything shouldn’t be hot, like the stuffing box, but why risk burning your finger to find out. Electrical test - shot the the electrical panels and any other electrical connection to find loose (hot) connectors, check cables/cable bundles and electrical components/DC motors that might be hot from low voltage/voltage drop or are malfunctioning. 1) Start by reviewing a few of article and resources listed below on ESD that include tips prevention and instructions on testing for ground fault leaks. 2) Help get the word out about ESD by talking to other boaters, freshwater dock owners (with shore power), marina owners and especially anyone about to go swimming within 100 yards of a dock, marina or boat with shore power. Ask freshwater dock owners and marina operators to prohibit swimming at their facility and post ESD warning signs. Kevin Ritz article, "A Preventable Dockside Tragedy"
Test the amperage between your alternators and the house and/or starter batteries to insure the alternator(s) are still outputting the expect amps. A clamp-on amp meter makes this an easier task. Check for and clean any corrosion on your electrical connectors. Corrosion can impede voltage which can lead to electrical faults, failures or damaged equipment (i.e. windlass, pumps, motors and electronics). If the house or starter batteries are older, load test the batteries annually or before re-installing them after winter storage to insure the batteries are still good. For more recommendations, see the Electrical Tool and Supplies page. They are my favorite hand tools, aside from Vice-grips! For more information see the Boating Books Recommendations. For more information see the Boating Book Recommendations. Do Not Leave Port Without it! 1) Water Alarms in each bilge (independent or part of an alarm system), lets me sleep better at night knowing that I AM NOT going to wake up to floating floor boards and being alerted to a problem when the leak has just started give me more time to find and resolve the problem. The loudness of the First Alert Water Alarms (WA100 for $12) used to scare the #@#% out of me plus the alarm is so loud that I couldn’t figure out which direction the alert was coming from. So we’ve added a second wireless Skylink alarm (434RTL for $29.99/starter set) that goes of first, display which alarm went off on the base unit and allows me to silence the alarm while we are trouble shooting. We keep the First Alert Water Alarms (WA100) in each bilge plus next to the holding tanks, sending instruments and seacocks in the boat. If a valve or holding tank is leaking, even a little, we want to catch it right away and not when the engine is underwater or the bilge is full #@#%. We selected First Alert over other water alarms because the First Alert Water Alarms are shock (up to 3ft drop on concrete), splash and water resistant. In the last years, the water alarms have paid their way twice. The first time, the exhaust pipe cracked, pouring the exhaust water into the bilge instead of out the thru-hull. The water alarms sounded in minutes giving us plenty of time to shut down the engine and close the raw water intake valve so that we could make repairs. And more recently, the forward alarm sounded when the holding tank started to leak just a little at a bad hose fitting (much nicer to catch it when it’s just a few ounces than after a complete failure). There are also complete alarm system that have water alarms and independent water alarms that send text message via WiFi. 2) Bilge Pump Counter is an indispensable meter for peace of mind or knowing if and how bad a water problem might have. Our bilge pump counter counts the time vs how many times the bilge pump has started. Knowing whether the pump is running now or how long the pump had run, lets us know if the problem is happening now or what amount have water has been pumped our from any number of causes. For example, if we had rain, were there any deck fittings, drainage hose, hatches or ports leaking? If no recent rain, if there a leak with the fresh water system (e.g., water tank, hot water tank, pump, accumulator, hoses or shut off) or is there sump pump not working causing the sump box to overflow (aka shower or sink) or a hull fitting (e.g., thru-hull, seacock, sending instrument, grounding plate, stuffing box, rudder post, or associated hose)? 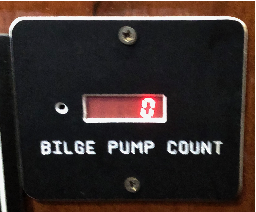 Knowing our bilge pump counter has historically been sitting on zero (“0”) except for when I periodically test to the bilge pump bilge pump floats, makes me smile every time I come back onboard after being away for any length of time. Eventually we might tie our high water alarm to our Spot Hug monitor. The Spot hug currently tracks the boats location and emails the boat’s position and daily status to me but it could be set up to send alerts from attached devices (aka anything that can send an open or close signal, like a high water alarm, intrusion detection, etc.). DAN Emergency Hotline: +1-919-684-9111 - 24 hours emergency advice in any language. Travel Assist - Emergency Medical Evacuation for the injured and a companion from anywhere in the world. And the new DAN Boaters offer even more. 4) And according to Nigel’s book and we absolutely agree, don’t leave port with our voltage meter (see recommended book section). Note: many of the tools and supplies below have links to Amazon.com. This gives you an opportunity to gain further information about the tool, read reviews and optionally purchase the item and in turn gives us a small percentage of earnings for our Development and Cruising Kitty, which we thank you for in advance. For amazing underwater photography, including blackwater dives, check out The Living Sea. We love the turtle, dolphin and blackwater photos of baby swordfish, squid, sea horses and more. And for those living on boats or in humid environments, Laz’s photos are available on aluminum prints. If you are heading to the Abacos, please check their web sites for "Wish List” items this school needs (e.g. office, school, workshop, sewing, arts & crafts supplies). For more information, also see Christine Kling’s article. Thank you for caring.